Day 3 of Just Jingle Giveaway Week is going to be yet an AWESOME DAY! Remember, there are TWO giveaways per day, one at 8am and one at 3pm, they are all open for a full week, so be sure to go back a few posts to enter them all! Today's giveaway is sponsored by the super fabulous Reverse Confetti!!! Reverse Confetti has the CUTEST line of stamps (with some particularly awesome sentiments, if you ask me!) along with fabulous cut files, too! One lucky winner is going to receive this adorable Oliver Owl stamp set from Reverse Confetti! CUTENESS!!!! I love his glasses so much! And those sentiments!!! You guys know I'm a sucker for a good pun! 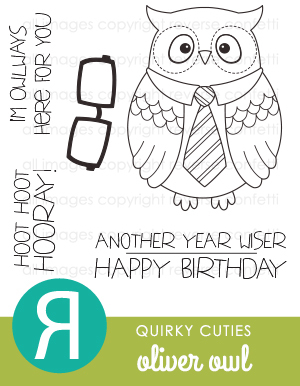 Here is a card that I created using a great sentiment from Reverse Confetti! The basket of flowers is free-hand watercolored. I actually did it on the airplane on my way home from Indy! LOL! One winner will be chosen from all comments on this blog post and the Facebook post combined. One entry per entry location per person. Don't forget to check out the previous giveaways! Each one is open for a full week! WOW!!! Your watercolor is AMAZING!!! Beautiful work! And on an airplane no less - I'm impressed! And LOVE that adorable owl! So cute! free hand? That's amazing! Love your watercoloring! Your freehand watercoloring is incredible. Wow. Beautiful card! 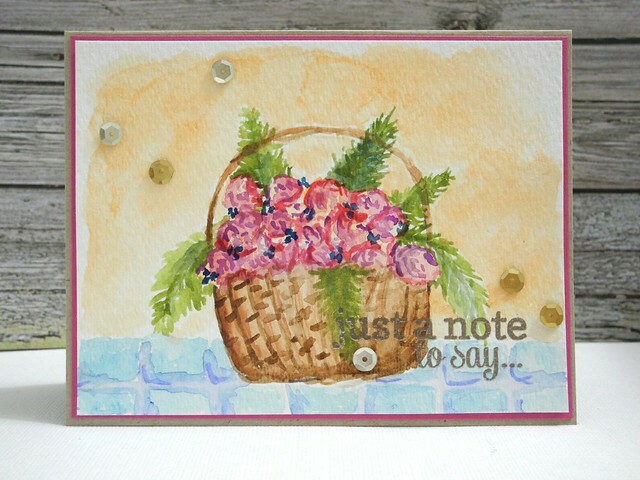 WOW - fabulous card - LOVE your beautiful basket of flowers!!! Very cute owl set and love your freehand watercolored basket of flowers! Great stamp set! I love the glasses. I love travel art. Once I took a train across the country and colored postcards for my friends with crayons. Sadly it was so pre-digital it didn't even occur to me to photograph them. And then there was the time I was crocheting little naked lace men on the train lol. Wonderful stamp set : D. Owl be back for the next one too. Free-hand watercolor, on a airplane? !...You ROCK! Love it! Maybe I should plan a trip requiring an airplane ride to get some crafting in...I certainly can't get a second to do it here at home! Lovely card! Wow, thousands of feet above the clouds and still able to create amazing projects! I'm very impressed with your freehand water coloring! Enjoy your "hump" day! I like your little logo gnome guy! Cute! Reverse Confetti is a great company! I have several of their dies/stamps! Happy Wednesday! beautiful card...looks like a painting! I have a serious crush on Oliver Owl....I think he needs to come live with me....LOL I LOVE your watercoloring and am jealous of your talent. I am the one "WHO" should win this. My friend is an owl lover and we have found her some really different ones over the years. That Oliver Owl is a Hoot and a half! Love your free hand watercolor card too...gorgeous! *boom* that is my mind being blown! a) you free hand watercolored that basket of flowers?! dude...amazing!! and 2) YOU DID IT ON A PLANE?!?! get out!! i want to sit next to YOU on a plane!! lol!! Just beautiful. Reminds me of a picture that used to hand on the wall at my grandmas house. You painted that pretty basket on an airplane...wow you've got skill and patience! The basket of flowers is colored so nicely. I envy people who can make things look so realistic. I love RC's stamps. Have several already but will be adding more in the future. Aw, what a cute stamp. Thanks for all the giveaways! Your water color painting is so beautiful. I wish I could paint like that. I can't believe you did that on an airplane!?!!? Definitely one to frame!! Sadly I do not have any reverse confetti stamps or dies, but I have seen them and oohhh I NEED some of them, so winning this would further add to my hoarding of totally awesome craft supplies! Thanks for the chance to win. WOW!! Freehand? You are very talented!!! Love your card! Adorable owl. Looks like he would make an excellent Father's Day card! I love his tie! I think you should do more free-hand watercoloring. Your basket of flowers is lovely! You did that watercoloring on a plane? For reals? I can't do that sitting at my table. Geez! I have been in love with that owl since I first saw him. He needs to come live with me. That's so fun that you watercolored that basket on a plane! Always creative! Love the watercoloring and more impressive is the fact that you did it several miles above. Amazing!!! Those 'drinks' on the plane really got your creative juices flowing....gorgeous! Awesome card! Love the watercoloring! The next time I fly somewhere, I am taking my watercolor set. Your flower basket is so pretty! Must have been a smooth flight! My gosh, this stamp set is so cute. And I love your watercoloring. I am just getting into learning about watercoloring and your card is great inspiration. Thank you for opportunity to win! I can't imagine a cuter stamp than this owl stamp...except an owl stamp set with glasses!! Score!! Also love love love your watercolor card! What a great way to pass the time on an airline flight...keeps your mind off the whole impossibility of flying thing! Nooooooo way! You did this on an airplane? Ahhhhhhhg - I can hardly watercolour while having coffee as I've been known to dip my brush in it I'm concentrating so hard! Gorgeousness, watercolouring is my favourite card medium! WOW..... I can't believe you did this on an airplane. It is simply stunning!!! I wish my watercoloring was as good as yours!! Hmmm, if you look at my profile photo you will see that I am destined to win this cute owl set! And note that I am not saying PICK ME, I am just stating the facts, lol! What a beautiful watercolor card...and the fact that you created it thousands of feet up in the air adds even more interest! 'Owl' your designs! Indeed, the owl stamp set is just adorable. My daughter's first animal word was "owl". She said before 'momma' or 'kitty' (we have two) so Owls have been an ongoing theme for her bedroom decor and toys. Fortunately, it is still her favorite. Funny how kids are born that way. Your basket id GORGEOUS. I LOVE the pretty colors. OK, you are now officially my crafting hero/goddess (your pick of title). Watercolouring on an airplane!? How awesome is that? Plus the result is pretty cute, too. Reverse Confetti is a new company, to me. Interested to see more of their products. Dang girl...you made that during a flight?? That's fantastic. Nice watercolor! I am just starting out. Hope I can be as good as you some day! Awhile back I started noticing owls everywhere and commented to a few people about it. Now everyone is buying me owl stuff. LOL I think this is an omen that this owl stamp needs to come and live with me. And it might be a boring comment but your basket of flowers is beautiful! Oliver, by Reverse Confetti, is an awesome stamp set! Lovely water colour card. Fantastic water coloring there! New to your blog and liking it! WOW!! That is some FAB watercoloring going on!!!!! I don't know If I can tackle something like that!!! Thanks for the chance to win! This is it! My favorite watercoloring card! Wow....! Stunning card. Just wow! I love owls and haven't seen that particular set. Too cute! I can't do fab freehand like you, so I DEEN (that's Reverse [as in Confetti] for NEED) stamps!